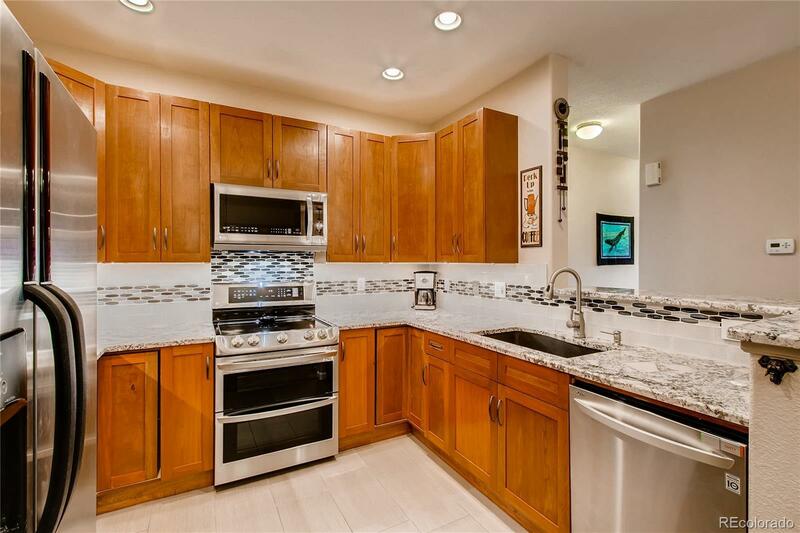 Welcome home to this beautifully remodeled Redstone Ridge condo. Top floor tranquility in a quiet location awaits. Relax or entertain in this open concept living space with vaulted ceiling and cozy fireplace. The kitchen remodel will impress, with newer appliances, built-in microwave with convertible vent hood, split oven, custom cabinetry with soft close hardware and cherrywood with mahogany finish, granite counter tops, oversized stone sink, under cabinet lighting with gorgeous backsplash and new tile floor. Escape to the master bedroom retreat with walk-in closet, huge master bath, dual sink vanity, soaking tub and plenty of storage. The 2nd bedroom doesnât disappoint, with partial mountain view. Whether to relax or for exercise, amenities have you covered with huge pool, spa, sunning patio, fitness center with weights and machines and a resident clubroom. 2-year-old HVAC. A one-car garage and ample parking round out this wonderful property. Welcome home.